The Icon of the Mother of God "Joy of All Who Sorrow"
The Icon of the Mother of God "Joy of All Who Sorrow" was glorified by wonderworking in the year 1688. A sister by birth of patriarch Joakim (1674-1690), Evphymia, who lived at Moscow, for a long time suffered from an incurable illness. One morning during a time of prayer she heard a voice: "Evphymia! Go thou to the temple of the Transfiguration of My Son; an image is there, named "Joy of All Who Sorrow". Have the priest serve a molieben with a blessing of water, and thou wilt receive healing from sickness". Evphymia, having learned that in Moscow was actually such an icon in the church of the Transfiguration on Ordynka, did the bidding of the MostHoly Mother of God, and she was healed. This occurred on 24 October 1688. 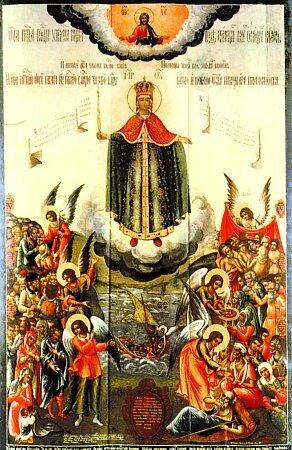 The account about the icon of the Mother of God "Joy of All Who Sorrow" (with its petty change welded by a bolt of lightning), manifest at Peterburg in 1888, is to be found under 23 July.